Here is yet another story for "the power of open source." I've been spending quite a bit of time working on SLAM with the Neato XV-11 using both the built in laser and the Hokuyo URG-04LX-UG01. 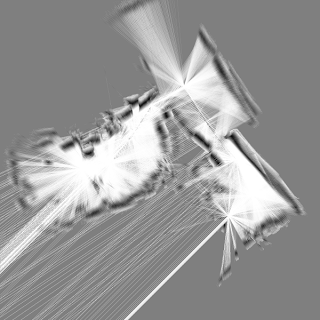 I had pretty much given up on gmapping working with the Neato -- until earlier today we found an issue with the scan angle increment computation in gmapping not working with the Neato laser specifications. 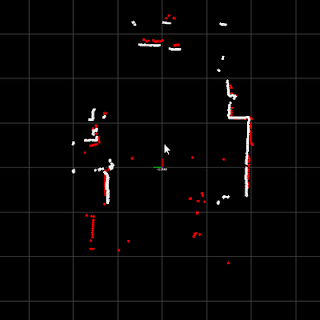 I probably wouldn't have found this bug had it not been for a user of the Trossen Robotic Community pointing out some issues he was having with gmapping, as my version still had some modifications from my PML work earlier this year. to slam_gmapping.cpp. 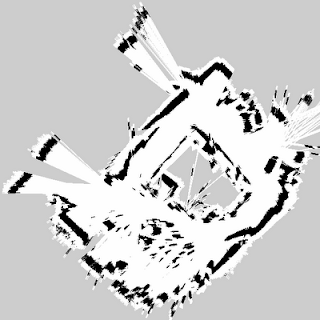 This uses the angle_increment from the laser scan, rather than the computed one, which is incorrect for full rotation scans. This will avoid issues with the scan being improperly inverted, and issues with scan matching. Next up on the docket of winter break projects: some updates to the ArbotiX ROS package, and a number of people perception algorithms. 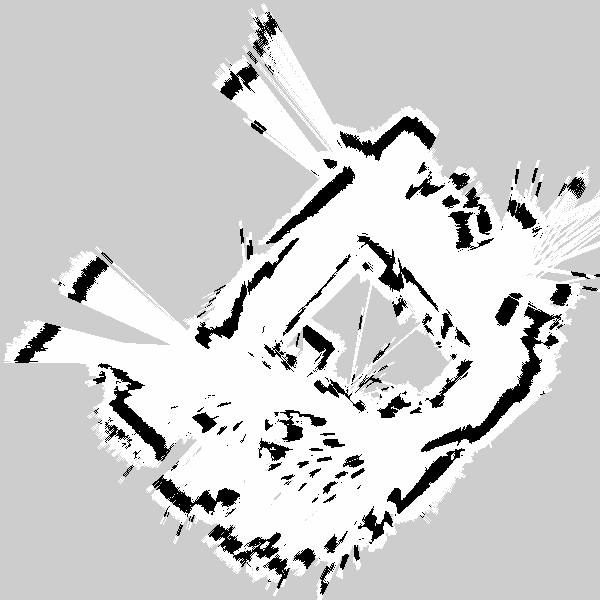 I've now get the Monte Carlo Localization turned on, map publishing working in ROS, and a number of parameters defined. This required some hacking of the CoreSLAM library, in particular I removed all of the references to differential drive odometry, instead loading odometry externally from TF. There's still some work to fix the way that the map->odom transform is handled, and allow a configurable map size and resolution (both of which will require reworking some more of the underlying library). I'm hoping to have the code released shortly. Over the past semester I've been spending a lot of time working with low-cost SLAM. In doing so, I've collected a number of datasets around the Albany campus. I've uploaded a number of them (as ROS bag files), along with sample maps, to my server: http://www.fergy.me/slam. All are free to use these datasets for whatever they please -- however, please post back maps and algorithms/parameters used to create them. Over time I would like to develop a set of best-known algorithms/parameters for low-cost SLAM. 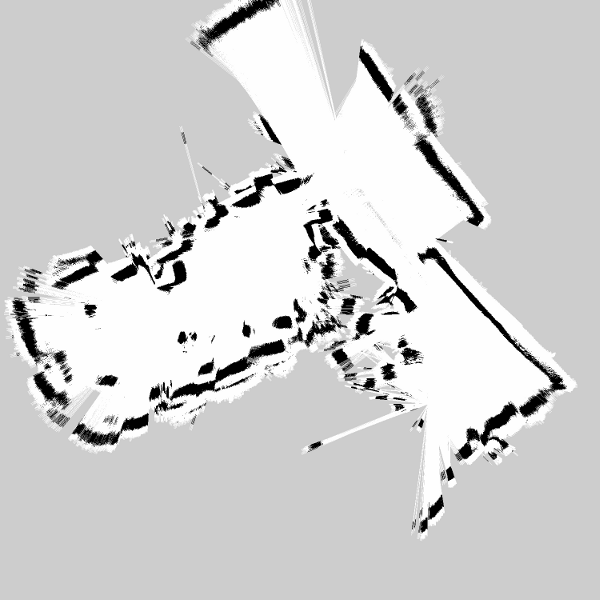 gmapping is the map building (SLAM) software most commonly used in ROS. It works very well if you have a very high quality and long-range laser. The Neato laser is neither high quality nor long range (and the low-cost Hokuyos, while fairly accurate, are still near-sighted). There isn't a lot of academic literature that mentions low-cost lidars (unless it's a paper about building a low cost module). One paper recently published that actually uses a short range Hokuyo is CoreSLAM, a SLAM implementation in under 200 lines of code. Well..., the map update/storage aspects are less than 200 lines of C code, however the complete system relies on a bit more, namely a particle filter for localization. This map is currently only using odometry, I'm going to try and get the MCL localization aspects working more tomorrow. I also need to get the map_saver to work with my ROS wrapper. I hope to have this on our SVN by the weekend. 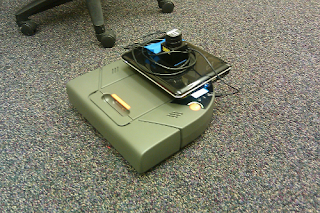 Code is now online in the ILS Social Robotics Lab (SUNY Albany) Repository. It's no secret that I'm a big fan of low-cost sensory. In fact, I'm a bit obsessed with it. And lately, we've been in cheap-sensor overload. Last month I picked up a Kinect, although I haven't had a ton of time to play with it yet. Luckily it looks as though the OpenNI+ROS drivers will be in good shape by the end of the week -- when our semester ends and I'll have a bit more free time. A couple of thanks to send out -- had it not been for this blog post by Hash79 of the Trossen Robotics Community, I probably wouldn't have even bought a Neato -- but all that data! 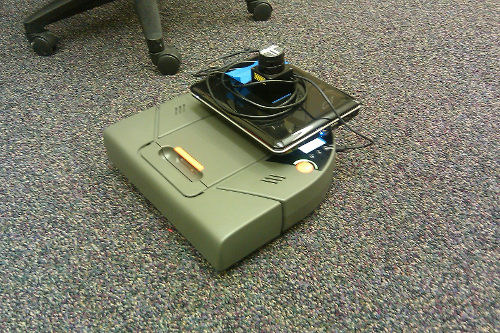 The Neato looks like it could be a very interesting competitor for the iRobot Create -- hopefully I can get the odometry/laser data to work in gmapping (so far, I've had *no* luck). More tomorrow -- as well as a code release (after cleaning things up).